Very cool boutique hotel in a great location. My room was nice and spacious. I wished there was a coffee/tea pot in my room. I had a great treatment at the spa and spent many hours lounging in the living room bar. The Citrus Club on the rooftop was also lovely with beautiful views of the bay and city. Friendly and helpful staff. I highly recommend this place. The Dewberry was a very nice hotel. There were some things I really liked about it, the highlight being a nicely appointed room and bathroom along with a nice view. The meeting rooms were also very nice. Front desk service, especially night manager Jesse was awesome. Other areas were really lacking however. The gym was really tiny and it was basically a converted room. Hardly any equipment. Also they had a rooftop bar and a lobby bar but the lobby bar closed a little too early for my preference. Also the rooftop bar which is supposed to be one of the highlights of the property was closed two of the three nights of the trip and on the third night we were asked to make a reservation to go up there, even though I was a hotel guest, and we never got the chance to head up there. I didnt get it. Also the location wasnt as close to the waterfront area of the city. Easy access to King Street was a plus. 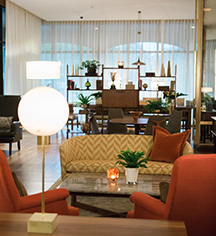 Hotel is in a very trendy neighborhood and is very sharp urban hotel. The staff were all very nice but amateurish. We arrived after 3PM and our rooms were not ready. The receptionist seemed a bit flummoxed and was not at all proactive. We waited in the lounge and occasionally went back to check in with reception. Was hoping they would come to us when the room was ready. At checkout I had was double charged for a breakfast. The receptionist could not edit it but said he would have the authorized person credit our account. I guess that happened, don't know yet because I left with a copy of the incorrect bill. One more nit pick...at check in a big deal was made that our stay included a car, when available, to take us within the immediate area. I called the concierge and said we were going to a restaurant in 15 minutes and asked if a car was available. Her reply was that there were no guarantees but we could reserve a car for a departure in 15 minutes for $25. While I understand the basis for the policy it was an off-putting response. This week, I am returning to the Dewberry for the 3rd time in three months. The rooms are lovely, the staff is pleasant and the location is wonderful. My first stay at The Dewberry, in January 2019 exceeded my expectations. The customer service was outstanding...from Jordan greeting me upon my arrival to Katelyn quickly and efficiently checking me in (early and with an upgrade! ), to the guest experiences employee who called me after I arrived in my room to see if there was anything she could do for me. I stayed in a lovely suite facing Marion Square (room 711) and enjoyed a fabulous dinner at Henrietta's that evening. My next stay, in March 2019, was booked through American Express Fine Hotels and Resorts. This time, I stayed in a basic, but nice, king room (room 717) facing Marion Square. The hotel was full, so, no upgrades were available. The stay was good, but, there was a conference of some sort going on at the hotel and the staff seemed a bit overwhelmed at times. We did enjoy food and drinks at all three dining outlets: Henrietta's, Citrus Club and The Living Room. Anwar was very friendly each morning at breakfast, the views at Citrus Club were lovely and the food and drinks at The Living Room were good, but, food service was VERY slow. 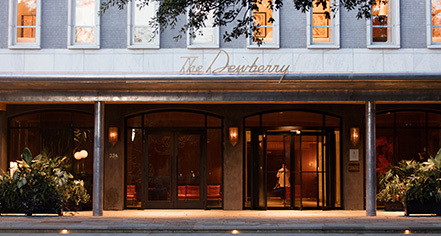 Overall, I enjoyed both my visits, which is why I have once again chosen The Dewberry for my upcoming stay in Charleston. Beds were so comfortable, and the hotel is so clean. Loved our stay. Rooms are small and charming. Guests have special access to the roof top bar, definitely take advantage. I can see why others say it's the best view in the city. Close to main attractions and hotel offers bikes.